Ding, dong, the big scaly black fire-breathing witch is dead. It’s been a great week for Wardens raiding! After our successes in Zul’Gurub on Wednesday and Thursday, Friday night saw us back in ZG teaching Arlokk how to eat dirt. Ain’t no oversized housecat gonna make the Southern Wardens into pussies! An eventful raid and a new strategy saw Arlokk dying to a DoT after all the raiders had already died. Flawless Wardens work, as usual, and that means next week we’ll be taking a look at Hakkar himself. Flush with the success of our raids this week, we traipsed into Ony’s lair to give her a good, stern talking to. 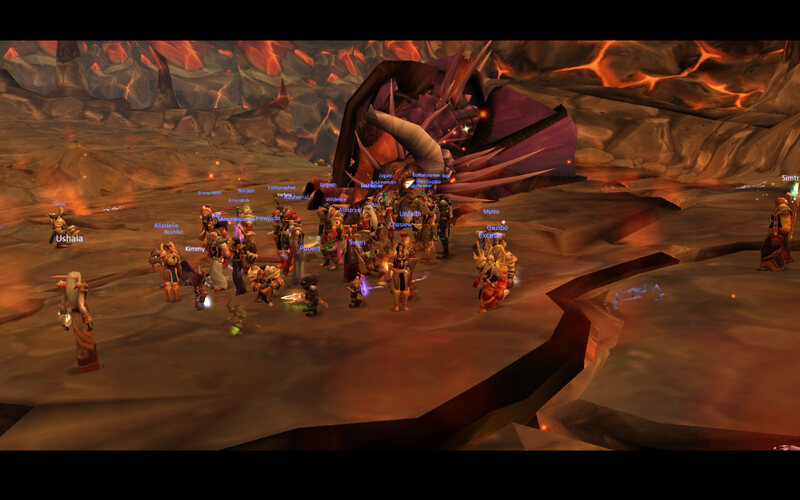 This was only our second Onyxia raid, and I’m proud as anything to report that on our second try we taught Onyxia how to die. Next stop Nefarian – who’s with me?! We downed her in flawless Southern Wardens style – which is to say, all the mages were dead and the main tank was barely held together with baling wire and bandaids. Verlyna got her [item]Quel’Serrar[/item] forged, and cries of “Not more hunter loot, someone fire the Master Looter!” resounded through raidchat as our lucky hunters found that Ony had dropped not one but two [item]Dragonstalker’s Helm[/item]. And a [item]Deathbringer[/item] for Verlyna, who will need to grow some extra arms to wield all these new weapons. Congrats also to Vikos on the Sinew required for his epic bow quest – remember, laddy, we want to see you wielding a bow that’s taller than you are. On a more serious note, I’d like to bid a very warm Wardens welcome – complete with teabags and loving abuse – to our new guildmembers. We’re honoured to have many former members of Heaven’s Cataclysm joining us; they’ve been part of our alliance to take down Molten Core, and recently decided they’d like to work with us even more closely. Welcome aboard, guys – we couldn’t be happier to have you, and here’s to a beautiful epic-laden future together.